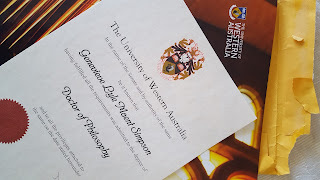 Yesterday I picked up my PhD diploma from the post office. Unfortunately, graduation ceremony dates were changed for 2017 so I happened to be interstate for the ceremony and missed my bow-and-tipping-of-the-cap opportunity... so it was all a bit underwhelming. But still, I'm finally a doctor! This won't be my final post, as I've still got a number of papers in the submission process (when will it end?!) so watch this space!